Dr. Sameer Bhandari, a Consultant in Anesthesia and Intensive Care at Pinderfields General Hospital in Wakefield, England, plays an integral role in the company’s Complete Ultrasound-guided Regional Anesthesia Education (CURE) course. Here, he describes how he teaches ultrasound-guided regional blocks to physicians in the UK. My relationship with SonoSite and ultrasound goes back many years, and I routinely use its systems in daily practice. I was approached to join the CURE faculty a few years ago as I was already running some ultrasound-guided regional anesthesia training courses, and was glad to get involved. Regional anesthesia using ultrasound is more accurate and safer than blind techniques, as you can visualize the nerves and make allowances for individual differences in anatomy. This enables the block to be placed very precisely, allowing a lower dose of anesthetic to be used and significantly reducing the risk of side effects. Another big advantage of using regional anesthesia is the decrease in bed occupancy; patients, usually, do not need to stay in hospital overnight, improving both patient flow and bed management, which is an absolute benefit in the NHS today. The majority of CURE delegates are anesthetists of all grades, although doctors from other disciplines – such as emergency medicine, ICU, and even plastic and orthopedic surgery – also attend. 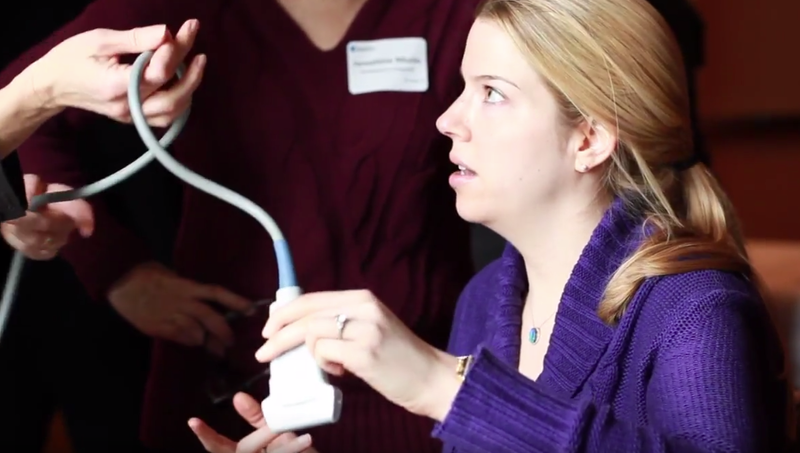 Course participants have varying degrees of ultrasound experience; some are junior trainees quite new to the technique, while others may be senior consultants enhancing their skill set for continuing professional development. Whatever their background, they realize that ultrasound has a place, whether it is as an aid to diagnosis, for regional anesthesia or for vascular access. The course covers all the major nerve blocks of the body and is very hands on; attendees receive background reading material in advance of the course so that they can study the theory beforehand, with lectures kept to a minimum. We demonstrate how to perform a scan and identify the anatomy, and then delegates have the opportunity to try it for themselves. To maximize hands-on time, course numbers are small – usually around 16 – with each faculty member teaching a group of just three or four people during the practical sessions. Delegates practice scanning on volunteers, moving between stations to gain experience of different ultrasound instruments and varying anatomies, and building confidence in their ability to identify the nerves. They also practice their injection skills on blue phantoms to help develop the hand-eye coordination necessary to administer blocks in patients. Delegates use a range of SonoSite systems – including the X-Porte, Edge, Edge II, SII, and S-Nerve – during the course. The instruments have been streamlined so that they have the minimum number of switches and dials, which makes them much easier to train on; I’m astonished at how quickly some of the newcomers pick it up. The systems are also very robust, and this proved a real asset when I undertook charitable work in Haiti and Sierra Leone. Ultrasound makes a huge difference to medics working in disaster areas and countries where anesthetic facilities are limited or non-existent, you can do so much with it. I have often joked that I can manage without my anesthetic machine but not without ultrasound! Ultrasound is a major step forward, and has made the administration of regional anesthesia a lot safer. The things you can do with ultrasound are phenomenal, and it is there at every stage of my daily practice. Take advantage of SonoSite’s educational workshops, designed to introduce you to point-of-care ultrasound best practices. Scheduled throughout the U.S., our Visual Medicine™ presentations will enable you to work on scanning techniques while “test driving” the latest in ultrasound technology.